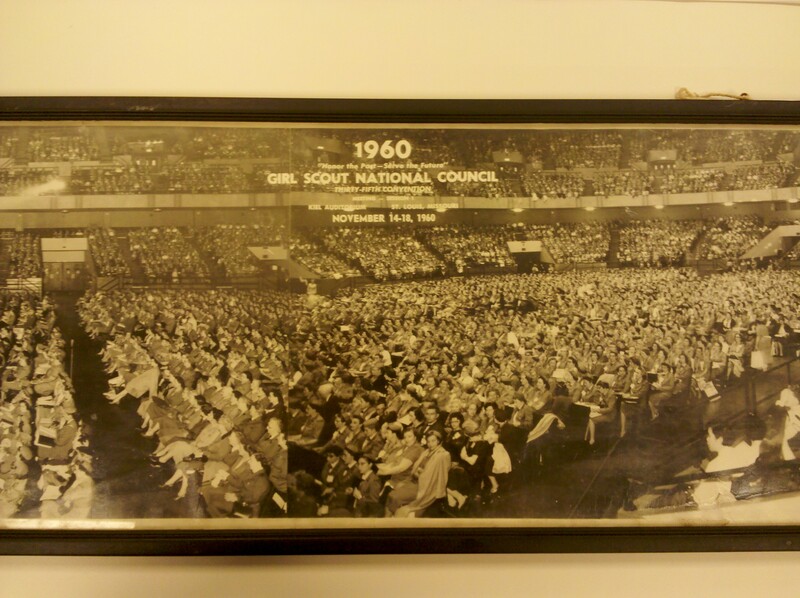 1960 GSUSA National Convention framed photograph. 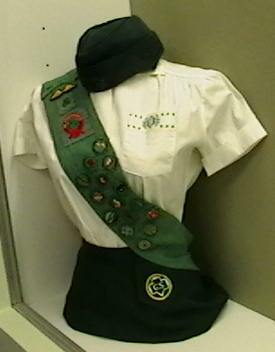 From the collection of the Girl Scouts of Greater Atlanta Archives. 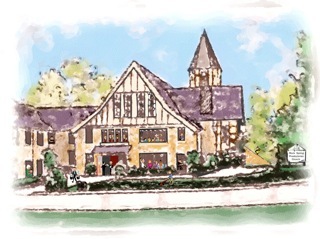 The Girl Scout National Historic Preservation Center (NHPC) is pleased to announce that History Conference 2013 will take place at Edith Macy Conference Center (EMCC/Macy), Briar Cliff Manor, New York, from Monday, 9 September through Wednesday, 11 September 2013. This conference is perfect for those starting or maintaining a GS Council Archives, and who have never been an archivist before. Be sure to mark your calendars and send someone from your Council to attend. It will be a great conference, and we will be posting more details as we have them. It’s that time again! If you missed it last year, it’s not too late! 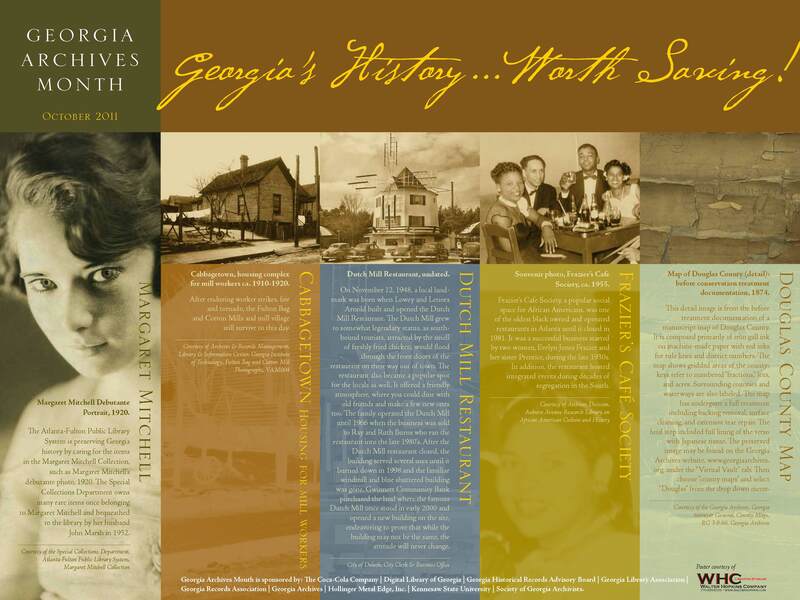 October is Georgia Archives Month, where we celebrate archives and history throughout Georgia. Last month and this month have been busy at the Girl Scouts of Greater Atlanta Archives, as requests have been coming in for information on Council history and loans of material for programs and exhibits. Everyone is gearing up for the 100th anniversary of Girl Scouting! We are so excited! What sort of questions are you asking at troop meetings or service unit meetings? We would love to start compiling a FAQ of Council and Girl Scout history that you could share with your scouts and parents. Please send in your questions to helpline@gsgatl.org. We will create a new page on our blog devoted to helping you discover more about our Council and Girl Scout history in general that you will be able to access 24/7 (or at least when your Internet connection is working). Come in to the HQ in Mableton, Georgia, and view our exhibits on the way to the Badge & Sash store, in the main training room, or while you visit the Resource Room. We have handbooks, uniforms, dolls, quilts, and camping exhibits that illustrate our rich history. When did this camp start to be used by the Girl Scouts? How often is this campsite used? What are the conditions of this camp? How long has Scout Haven been around? Do you know when this home was built? Where can we find the records of this home? Falcon's Roost Lodge at Camp Scout Haven. An ideal "first-time" camping unit in a quiet setting. The resources we were able to provide were the Girl Scouts of Cobb County Scrapbook (1947-49); photographs of Camp Scout Haven from 1956 and 1957; personal recollections of Scout Haven, collected by Sue Belden, Girl Scouts of Greater Atlanta Archivist, from Alice Harbin, Executive Director of the Cobb County Girl Scouts in 1957; camp and financial reports garnered from the Gerry Wells collection by Sue Belden; and Scout Haven-related articles from “The Council Bulletin” and council day camp brochures. The students have promised to send us a copy of their research paper and video interview with Margaret Paschal, Archives Committee Member, and to let us know when their project will be on display later this spring. 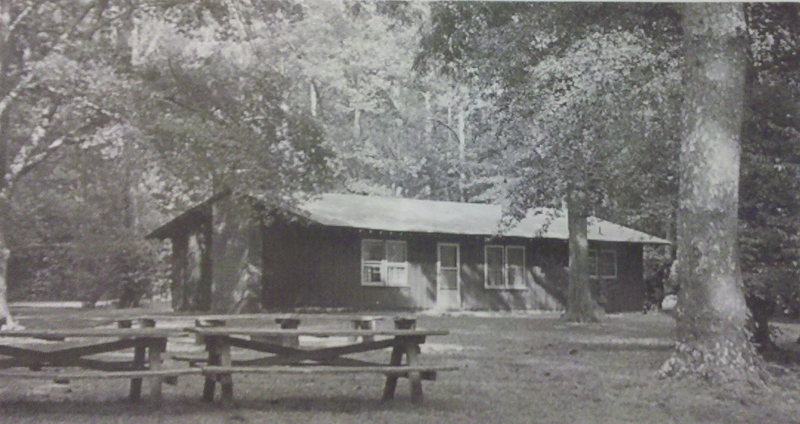 The beauty of the camp site was the main reason Alice Harbin accepted the position of Executive Director of the Cobb County Girl Scout Council in 1957. 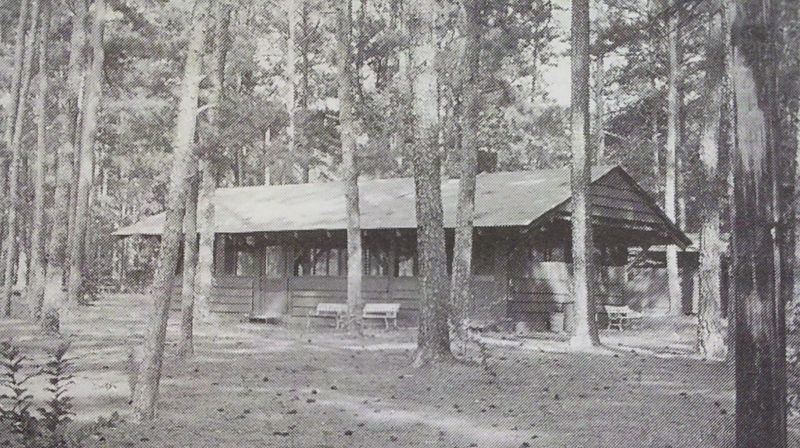 The first building built at Scout Haven was the “dining hall” – the screen building later known as the summer lodge and now as part of the Swaying Pines day use area. The platform tent units (Green Grove and Sunny Hill) were not completed and named until after the great merger in 1964. The cost of ten days of day camp in 1966 was $9.00. The tornado that came through the camp in the 1990s skipped over the lodges and huts but dropped pine trees on the tents and unit shelters; only the tent platforms survived! 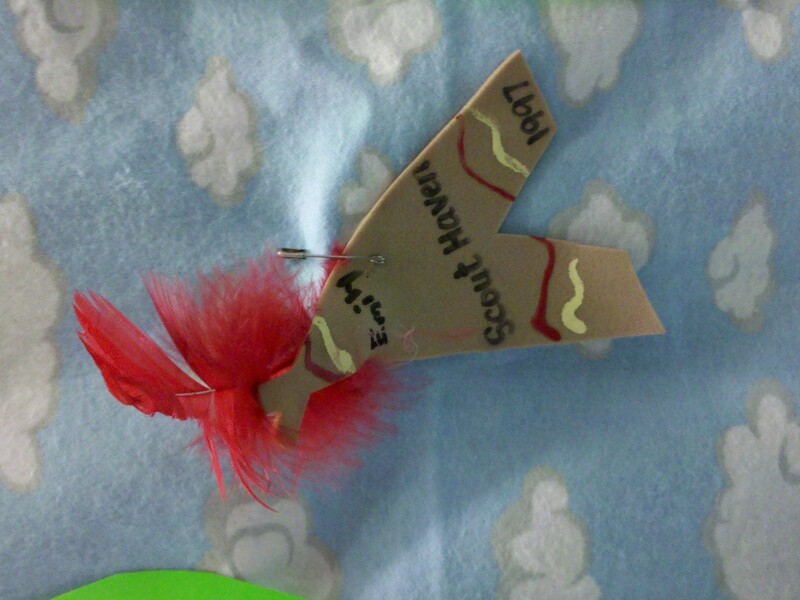 Do you have memories of Camp Scout Haven you would like to share? 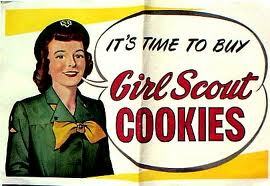 You can post a comment here, visit our Girl Scout Memories Facebook page, or fill out the “It’s Your Story…Tell it! form on the Girl Scouts of Greater Atlanta website. We are all ears! 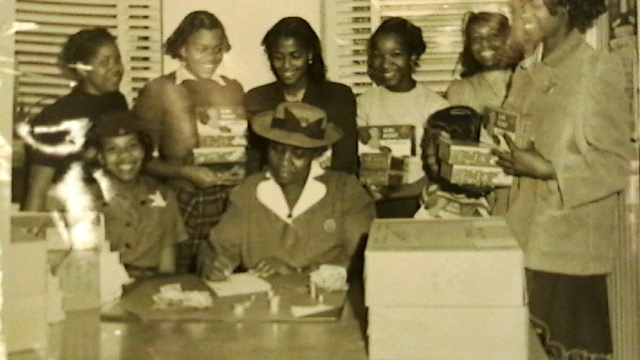 As soon as the Atlanta Girl Scout Council was organized in 1921, Girl Scouting grew by leaps and bounds. 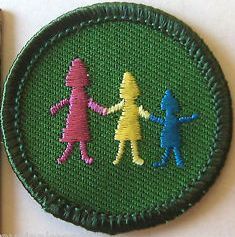 Within a year, the council had grown from five troops to 27 troops with a membership of 562 registered Girl Scouts. All of the troops were organized at the request of the girls themselves. In 1915, the first Girl Scout troop in Atlanta was organized at Rock Spring Presbyterian Church, then in suburban Atlanta [now in the Piedmont Heights neighborhood of Atlanta between Monroe Drive and Cheshire Bridge Road]. The troop of 18 girls was led by the pastor’s wife Mrs. A. Linton Johnson who organized the South’s second Girl Scout Camp in 1915. The troop disbanded when Mrs. Johnson left Atlanta after her husband enlisted as a U.S. Army chaplain at the beginning of World War I. By the time the Atlanta Council was founded in 1921, there were five troops in the city: at Fort McPherson, Girls High School, North Avenue Presbyterian School (Bolton, GA), and St. Luke’s Church. They were “lone” troops with no connection with one another. They conducted their program through correspondence with national headquarters, then in Washington, DC. The Atlanta Girl Scout Council began on the morning of July 12, 1921 at 611 Peachtree Street, home of Mrs. Albert Thornton, who called together a group of women to organize Girl Scouting in the Atlanta area. The group elected officers and made a formal application to the national council for a charter. The original council included Fulton and DeKalb counties. The charter was granted on August 5, 1921 and signed by Juliette Gordon Low herself. 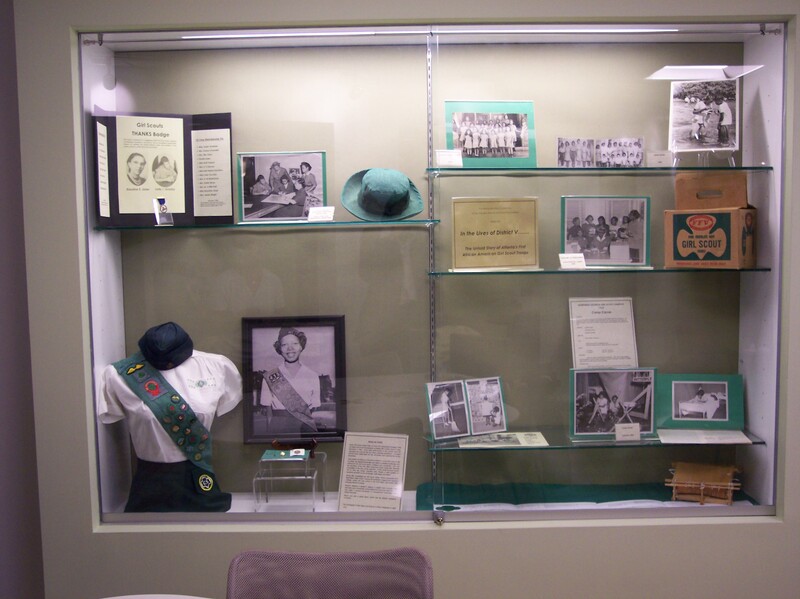 In our Georgia Archives Month Display, we highlight badges current Girl Scouts can earn that relate to history. At the Brownie level (grades 2-3), one of the badges that can be earned is called “Her Story” On pages 106-107 of Try-Its for Brownie Girl Scouts (New York: Girl Scouts of the USA, 2000), the badge description and suggested activities are listed. 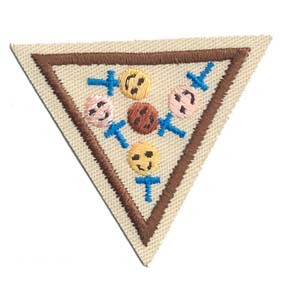 In earning the badge, the Brownie is required to do four activities out of six. A Girl Scout’s Story: Read about Juliette Gordon Low in your Brownie Girl Scout Handbook. Or check out her story online. Then try to find a woman in your community who was a Girl Scout a long time ago. Invite her to speak to your troop, if possible, or interview her. Find out about her memories of being a Girl Scout. Talk to Women: Ask five women to tell you about what they believe are the three most important issues facing women today. Make sure you ask women of different ages, from teenagers to women over 70 years old. Include at least two women from a race or ethnic group different from your own. How are the answers similar or different? Share what you learned with the other girls in your troop or group. Create Tales: What are some of your favorite fables and fairy tales? Would these stories be different if they were written today? How would the girls and women in the story be different? Or would they be the same? Change a story to show how today’s girls and women would think, feel, or act. Share your story with others. Write it down, draw a comic strip, or act it out. A Ceremony to Honor Women: Plan a simple ceremony to honor women. You can recite poems written by girls or women. Or you might like to perform a skit or make up a song about a woman in history or in your community. If you can play an instrument, play along to the song. Invite women who are special to you and your community. Help in Your Community: Service is an important part of being a Girl Scout. Look at the section on service on page 92 of your handbook. Would you like to do a service project that helps women and children? Choose a service project you would like to do, with your leader’s assistance, from the following list: 1) Make baby bundles. Include supplies like diapers, baby wipes, and bottles. Donate them to a community agency. 2) With your troop or group, make a quilt to give to a woman and her newborn baby at a local hospital. 3) Collect toiletries like toothpaste, toothbrushes, deodorants, shampoo, combs, and hairbrushes and give them to a shelter that helps homeless women. Your Story: Think about where you will be when you are a grown-up. Create a time line for yourself like the one below. Write in your time line what you would like to do or to have happen in your future. Georgia Women of Achievement: Recognizing and honoring women native to or clearly identified with the State of Georgia. Juliette Low was one of the first women inducted in 1992. Georgia State University’s Women Collection: Established in 1995, is dedicated to collecting, preserving and making available the documentary heritage of women in Georgia and the South. At the 2010 Annual Meeting of the Girl Scouts of Greater Atlanta, Morgan Coffey, 18, was honored as being one of ten 2009 National Young Women of Distinction. To be considered for this honor, the Girl Scouts had to have earned Girl Scouts’ highest award, the Girl Scout Gold Award, and spent one to two years on a community action project that has had far-reaching effects in her community and beyond. She wanted to help victims of abuse so she created both the Victim Support Initiative, which provides 500 brochures filled with helpful information for victims of abuse, and are distributed by the DeKalb Police Department’s Special Victims Unit, and Change in a Bag, which provides abuse victims a fresh change of clothing. Morgan also founded the non-profit, Stronghold Atlanta, to help women and children who are victims of domestic violence. The full press release from March 18, 2010 is in PDF. As Georgia Archives Month comes to a close, it’s only fitting to also bid Happy Birthday to our founder, Juliette Gordon Low. This year marks her 150th birthday, as she was born October 31, 1860. Juliette shows up on the recent edition of the Fall 2010 issue of the Georgia Historical Quarterly, gracing the cover in a kimono, ca. 1886, just in time for her birthday. The issue includes a photo essay, Girl Scouting in Savannah 1912-1927. 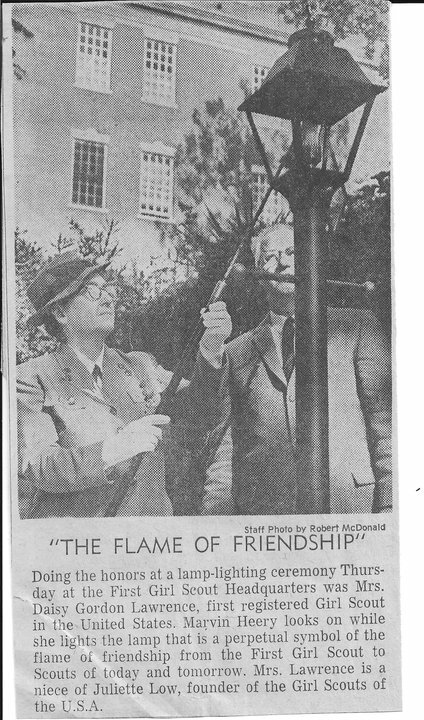 On Sunday, October 31, the Girl Scouts First Headquarters relit the “Eternal Flame of Friendship” in the courtyard of the former Low Carriage House. It was originally lit at Girl Scout First Headquarters on November 14, 1963 by Daisy Gordon Lawrence, Juliette Gordon Low’s niece and the first registered Girl Scout. The re-lighting ceremony focused on the future. Girl Scouts who attended the Girl Guide Centennial bonfire in England re-lit the flame of friendship in Savannah, linking Girl Scouts to their international sisters as they begin their journey toward the 100th anniversary. A recent biographer has a blog about Juliette, where her two recent articles detail Juliette’s 30th and 32nd birthday. It’s a fun read!